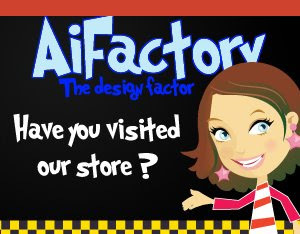 I've been asked to design for AiFactory! The owner Mia' contacted me and asked me to design for her company. I am so excited! She offers digital stamps, clip art, digital paper, photoshop brushes and much more! I just got my first digis today and I'm SO excited to start playing with them! You'll see samples from me soon! You can check out AiFactory on Etsy too. And if you want, there's a AiFactory Ning group where Mia offers tons of freebies and tutorials. Mia' also has a blog where she offers tutorials if you want to check that out as well. I'm so excited! This is my FIRST company design team! I'm also super excited the Mia' picked me based on my blog and trusts me to help her. Eeek! Happy happy happy Monday everyone! CONGRATS and big hugs and loud EEEEEKs!!!! BIG CONGRATS! off to check it out. That is so cool and I can't wait to see all your AiFactory MOJO! I even saw your name under the DT. HUGE congrats sweetie!!!! YAY! I am SO happy for you! cant wait to see what you create!! hugs! Congrats girl! I knew the right DT opportunity would come along for you! Can't wait to see your creations! Congratulatons. Can't wait to see what you do. CONGRATS GIRL! You deserve it! I'm so excited for you! Yea! I look forward to all your projects!!! I'm off to check them out! congrats, this is wonderful, and love the new look of your blog Ashley.